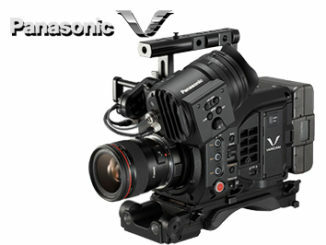 Looking to boost sales of their high end Panasonic AU-EVA1 in 2019, the camera company has announced a $1,000 price cut, to bring the EVA1 below $6500. 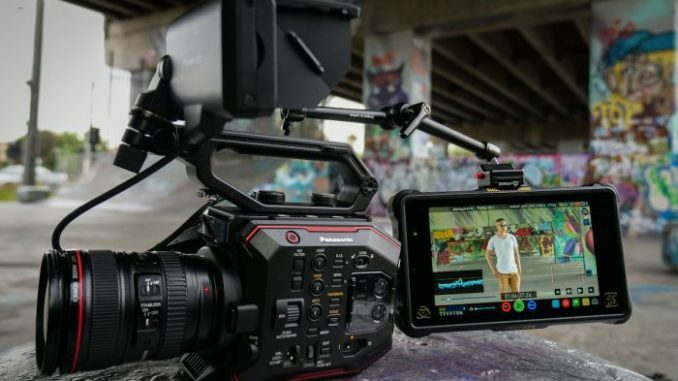 Though Panasonic sells the EVA1 as a 5.7K camera, that resolution is only available when recording in ProRes Raw and through an external video recorder like the Atomos Shogun Inferno. Internally, the EVA1 records in 4K, but at 10-bit 4:2:2 and with up to 14 stops of dynamic range. That’s nothing to shake a stick at. In spite of it’s feature set, I’m simply amazed that Panasonic hasn’t opened up its Super 35mm 5.7K sensor for internal recording, nearly a year after the EVA1 was announced at CineGear. 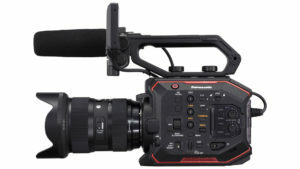 When you consider the price of a competitive platform like the Blackmagic URSA Mini Pro, which can provide 4.6K and an additional stop of Dynamic range, and record in Blackmagic’s own flavor of Raw at 4:4:4 at either 10-bit or 12-bit, plus HDR in Rec 2020 HLG. And, it costs $1500 less. The EVA1 was meant to fall in between the Panasonic GH5s and the Varicam series. 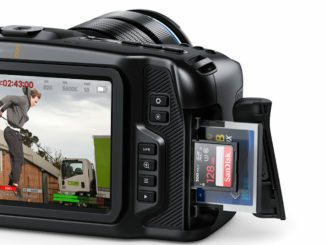 But that was before the full frame mirrorless craze hit last fall, and Panasonic announced the S1. So, with a more portable 4K full frame mirrorless options, how does that affect the future of the EVA1 without unlocking internal 5.7K recording? Sure, it would have several additional features that the MILC cameras aren’t offering (yet), it seems to me that Panasonic would want to open up that 5.7K sensor for internal recording in order to keep ahead of the pack. Am I missing something? 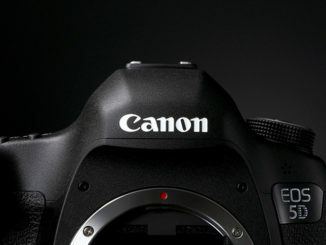 Is there something about the EVA1’s architecture that can’t enable the 5.7K sensor to be all it can be without the aid of an external recording source? 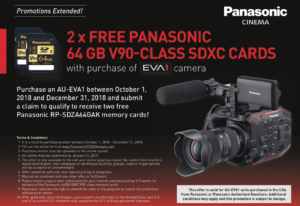 Moreover, in addition to the price drop, Panasonic has extended their Black Friday offer of 2 64GB V90 SD media cards through a rebate after purchase from an authorized dealer. The price cut seems to be permanent, but the V90 SD offer ends March 31, 2019.